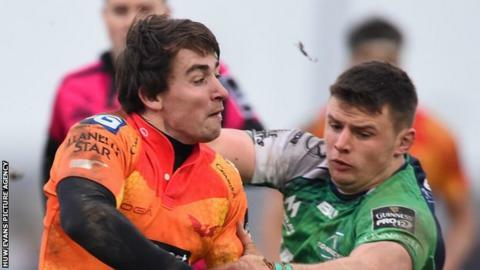 Welsh international scrum-half Rhodri Williams will leave Scarlets to join Bristol at the end of the season. The 22-year-old has signed a two-year deal with the Championship side. Williams made his Wales debut against Tonga in 2013 and has won three caps, scoring his solitary try against Scotland in the 2014 Six Nations. He has made 79 appearances for Scarlets but is behind Wales squad members Gareth Davies and Aled Davies in the region's scrum-half pecking order. Bristol-bound scrum-half Rhodri Williams scores for Wales against Scotland in the 2014 Six Nations Championship. "Rhodri is a talented scrum half with a burgeoning international career ahead of him," Bristol director of rugby Andy Robinson told the club website. "With a wealth of experience at both domestic and European level, he will bring an added dimension to our young and exciting backline." "I'd like to thank everybody associated with Scarlets during my time there. It's a great club and I've enjoyed every minute and have made lifelong friends," said Williams. "I will continue to give my all to the Scarlets as we look to secure that all-important top four place in the Pro12."